Time and money are two of the most valuable assets we have. As a working mom, I try to save time when it comes to managing my home. The kitchen is a place where we spend a ton of time. My goal is to get nutritious meals to my family as quick and inexpensive as possible. When I started using these time saving hacks, it made it so much easier to get dinner on the table FAST. 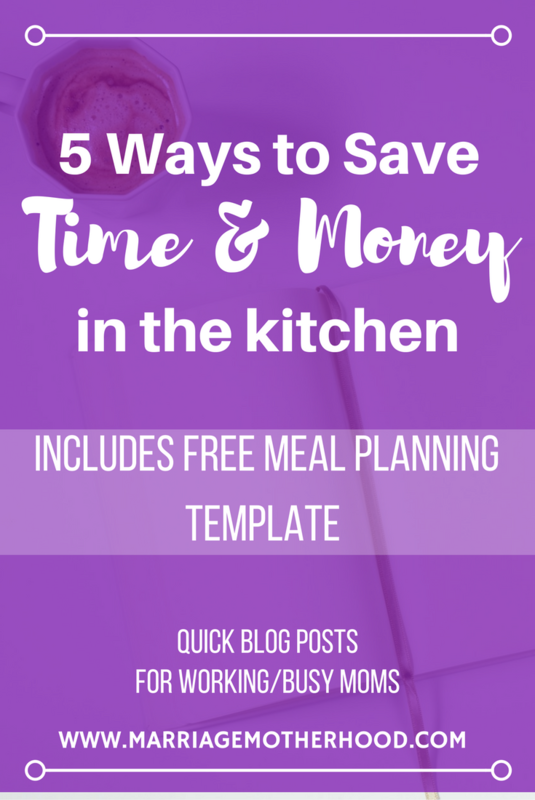 Download your free meal planning workbook! Meal planning helps save so much time. Sometimes the hardest part is deciding what to make for your family. Do that work ahead of time and all at once. Pre-cut ingredients that you use often and store them in a mason jar. I love cooking with onions, bell peppers, and yellow peppers. As soon as I return from grocery shopping, I immediately wash then dice them. They will stay fresh in the mason jar all week! Any time I need them, the time consuming part is already done. My family LOVES rice. My girls can eat it everyday. It helps to get it on the table quickly when its already cooked. Just portion out the rice and store in freezer bags. When ready to thaw, just pop it in the microwave for a few minutes. Buy Meat in bulk. Cut and Season ahead of time. I buy my meat in bulk from Costco (Have you seen my Costco hauls?). I also cut and season the meat before I freeze it. That way you already have it portioned and seasoned for particular meals. Keeping an empty dishwasher allows you to clean as you cook. I try to empty the clean dishes as soon as the dishwasher is finished, when I can (Watch me clean my kitchen). So the heavy lifting is done once your meal in complete. Grab your meal planning template!